A brightly decorated shed is home Timmon's Folk Art Store in Pleasant Bay along the Cabot Trail in Cape Breton, Nova Scotia. 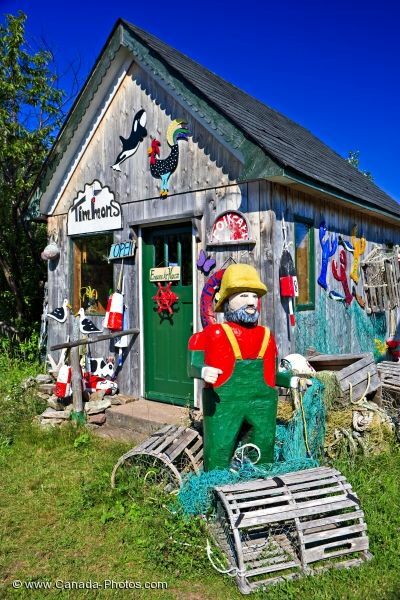 All sorts of handcrafted art pieces adorn the exterior of a shed but once you enter through the door, a whole new world of art work is displayed at the Timmon's Folk Art Store in Cape Breton, Nova Scotia. This cute little shop is well worth seeing as all the pieces on display are unique which makes buying a souvenir from here a true treasure. Picture of a building which is home to the Timmon's Folk Art Store in Nova Scotia.